Since I started uploading outfit posts not long after starting my blog, I’ve always stuck to taking the photos in my back garden. Therefore, being extremely jealous of anyone with the guts to step outside the comfort of their garden and snap their photos wherever they want. 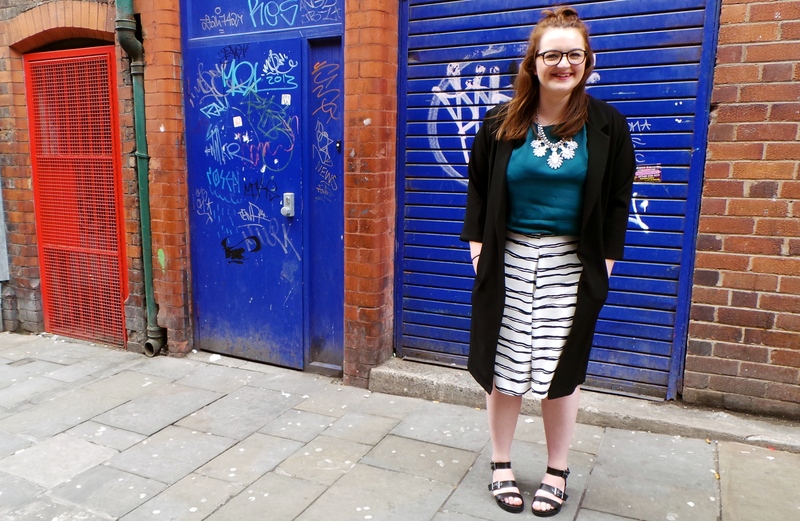 Whilst I don’t look as fancy as said bloggers who will happily stand in the middle of a street and get photographed, I feel pretty happy with myself having leaped out of my comfort zone. Whilst in Liverpool visiting some of my favourite Liverpool bloggers, to talk future North West Bloggers plans I posed for the above. I’d like to say a huge thank you to Helena from Beaut Chic for taking these photos for me, whilst I was heckled by a passing taxi driver! I’ve fallen in love with the culottes trend after buying a black pair a couple of weekends a go. Whilst on one of my many trips to Primark on my lunch break I spotted this gorgeous patterned pair. They were only £7 in the sale and after being torn about whether they suited me, I bought them, deciding I’d regret it if I didn’t. I’m SO happy I bought them as I think they look lovely with this teal top from River Island. My shoes are a huge leap out of my comfort zone as 1. I hardly ever get my toes out (I hate feet) and 2. I didn’t think I could pull off the whole chunky heel thing. My sister picked these out when we went shopping in New Look the other week and as I was feeling rich (payday!!) and they were too wide for her, I snapped them up. When I tried these on in store I instantly fell in love as they seemed soooo comfy! Usually this is the case until you actually wear them out, but I was pleasantly surprised to find that these didn’t hurt my feet at all. They do have a small heel which is a big deal for me as I live in flats, but I couldn’t be anymore in love with these. 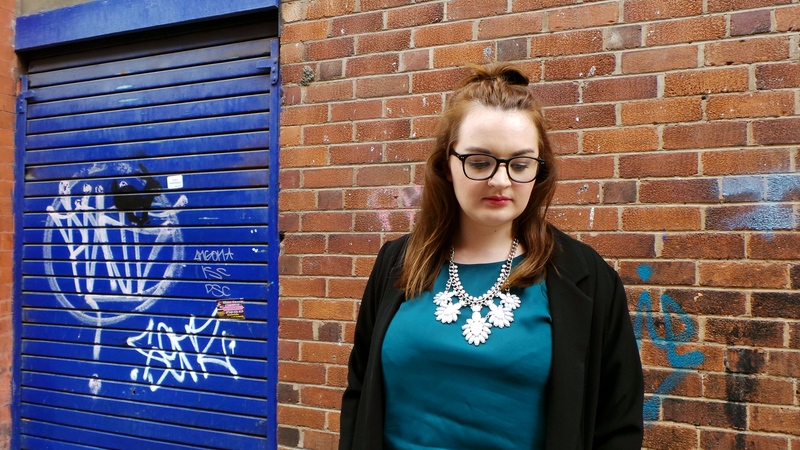 To finish it off I added the statement necklace and duster coat, both from Primark. I’m obsessed with this duster coat as it goes with everything – it will definitely be my go-to cover up this Summer. Especially as I like to rock black all year round! 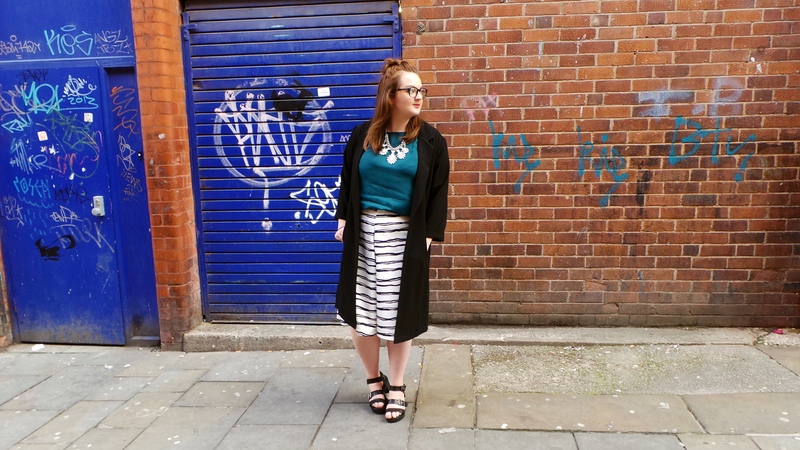 New Look and Primark are my favourite high-street brands, and they are killing it this spring/summer. It’s definitely worth going in if you are looking to update your wardrobe. Love the culottes so much, I want to go try some for myself! I think you’re going to have to make this ‘posing around town’ a regular thing, any excuse for brownies and giggles if you ask me haha! This is awesome & I absolutely adore the backdrop. I’m the same I always take my photos in the garden before I am about to head out – I too envy those who go out and about and do it! I have a post coming up shortly where I have jumped out of my comfort zone too. These culottes are amazing! I love them! I like the way you’ve matched everything. Love your outfit and don’t feel embarrassed about being photographed in public it’s part of the fun! 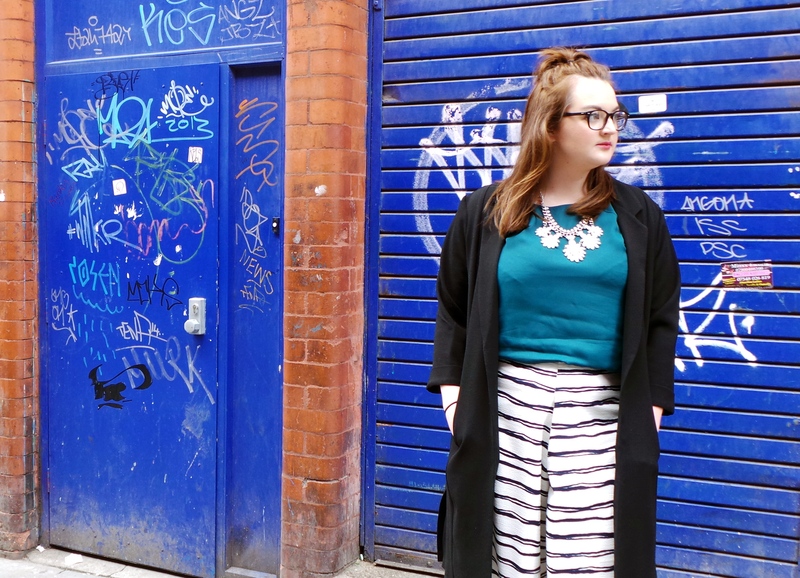 When I first saw the title of this post I thought ‘eww culottes, I can’t stand them’, but you absolutely rock them and I adore your outfit. I think you have actually changed my mind about culottes. A fab post, well done!! Love this outfit! Wonderful post. Do keep up the “photos about town” trend if you can. It really suits you! Love love love this look, those culottes are just gorgeous!